Brake noise causes anxiety and although such noise rarely indicates an actual issue, its presence will always raise concerns over the quality of braking components. In this safety critical category, noise can result in a damaging lack of confidence in a garage or motor factor. Comline’s Dr Keith Ellis explains. Of course, there are occasions where noise is there by design. Pads may feature acoustic wear indicators or ‘screech clips’. This is a clip (a bit like a tuning fork) which is designed to touch the disc during braking when the pad reaches around 2mm thickness, and as it drags against the disc, it vibrates and screeches warning the driver to check his pads. The other cause can be when no screech clip is fitted, and the driver has worn at least one brake pad right down to the metal and the brake squeals because of metal-to-metal contact. Clearly if there is significant noise coming from the brakes, they should be checked. 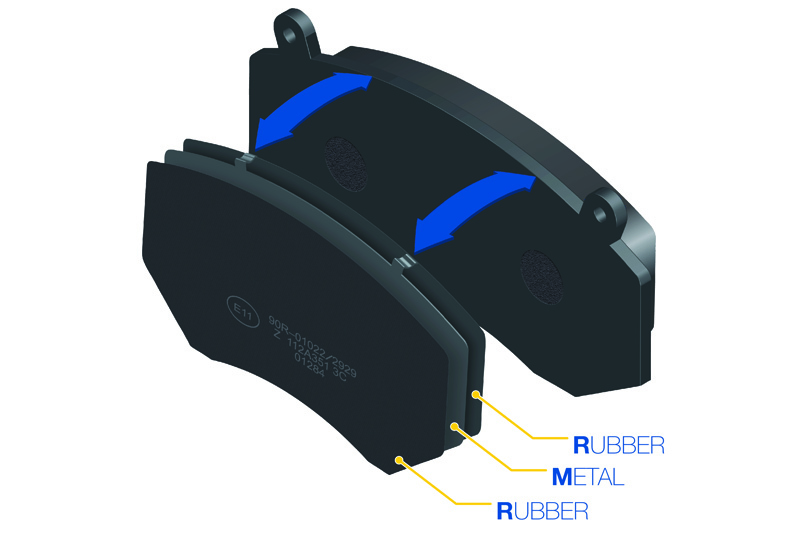 One of the techniques commonly used by brake pad manufacturers to combat braking noise is the fitment of a shim, a different clip-on device, which, when fitted to the back-plate of a brake pad, reduces vibration within the caliper – it’s this vibration that is a root cause of brake noise. However, there are many different shim deviates available across the aftermarket, with differing levels of quality and performance. Comline’s, Director of Braking Product Development, Dr Keith Ellis, provides further insight on brake noise and offers his expert opinion on the subject of backing shims: “Brake noise has been a common problem for drivers since motorised vehicles started to replace the horse and cart. “Arguably, the most common form of noise is brake squeal; put simply, squeal is caused by vibrations that result from the interaction between a brake disc, brake caliper, and brake pad. This squeal is more often than not directly influenced by various internal and external factors, including the temperature of the disc or pad, the ambient temperature and humidity in which they are operating, the speed that the vehicle is travelling at and the pressure being exerted on the pad under braking. “The shape of a brake pad can also influence brake noise, particularly under light braking pressures; the wrong shape can result in excessive noise, which is why you will see such a variation in pad shape by make and model. Here at Comline we fully appreciate the issue braking noise presents and have invested heavily in an array of noise prevention technologies including the development of our ‘RMR’ backing shims. When looking at shims, it is vital to understand that not all are created equal, the materials used, and the performance offered varies massively. At one end of the scale, you will find simple applications using bonded gasket paper or even rubberised paint, at the other, you will see more premium applications employing complex laminations and various material layers. 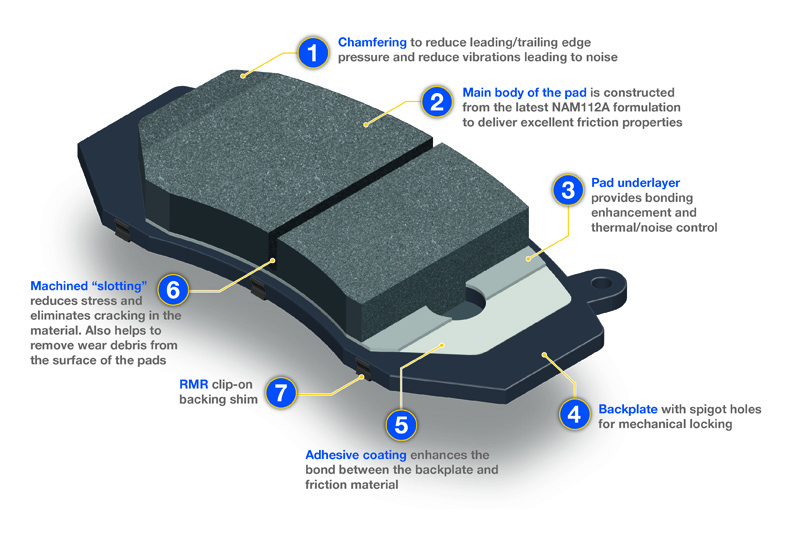 Currently available on over 500 of the most popular references in Comline’s current braking range, the ‘RMR’ shim is also now a standard feature on all new-to- range Comline brake pads. For more information about Comline’s brake range, click here.